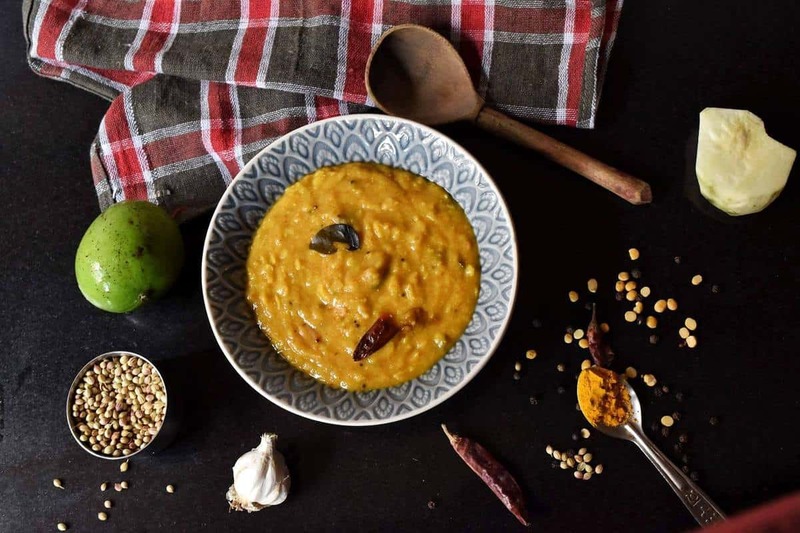 Tangy meets earthy, creating a delightful melange of flavors when raw mangoes and tuvar dal are cooked together; the balancing act brought by the popu or tempering done at the end. A classic Andhra dish that has become a favorite of mine now. Drizzle some ghee on top and serve with a bowl of steaming rice or even a bed of Samalu (little millet) like I do. Pair with ‘Enda Avakai’ (mangoes pickled under sun), and you’ve known what heaven is all about! I’m a South Indian by origin (Andhra-ite to be precise) who was born and brought up in Northern states by parents who had themselves never lived in South India their entire lives, until I decided to pursue 11th standard in Andhra. Back at my parents’ home, our food habits and cuisine preferences were from all over the place, Maharashtrian cuisine playing the lead, as my father grew up there. We did have certain picks from Andhra Cuisine – thanks to my maternal grandmother – like Vankaya Korikaram (Eggplants stuffed with chilli paste), Berakaya Menthikaaram (Ridge gourd stuffed with fenugreek paste), Sambar and of course, Mavidikaya Pappu, mainly owing to its tanginess. Hence Mavidikaya Pappu by default brings back memories of my grandmother and her amazing cooking. Also, it’s a one-pot dish and gets ready in a breeze, thus apt for days when you don’t want to cook elaborate recipes and wish to stick to a simple yet healthy comfort food. Tuvar dal complemented with brown/ unpolished/ red rice or millets is a fair source for protein and slow carbs, whereas raw mango is rich in A, C and B vitamins. Try it to believe how amazing it tastes! Soak toor dal for 15-20 minutes. Rinse afterwards until the foam/ bubbles stop forming at the top. Set aside. In a pressure cooker pan, add the soaked dal and all the ingredients listed under Dal. Replace the pressure cooker lid and allow 3-4 whistles. If cooking in an open pan, cook until the dal and mango are soft. For tempering, heat the oil/ ghee in a small tempering pan or heavy bottomed vessel. Add mustard seeds, cumin, fenugreek seeds and allow them to splutter. Add asafoetida powder, peppercorns, red chillies, garlic pods and curry leaves and stir for few minutes. Remove the lid of the pan and add the hot tempering to the cooked dal mixture. Mix well and continue to cook over medium flame for 10 minutes. Add water for desired consistency. Serve piping hot with ghee and rice or your choice of accompaniment.